It occurred to me the other day that TLFG must be hitting some kind of anniversary and it turns out this blog became a six-year-old at the beginning of October. How things have changed in that time. Back then, 50 page impressions a day was a big thing to get excited about. Now at least 10 times that is a given (still not much I know but it'll do for me). During that first season I was unemployed and childless so had a lot more time on my hands and went to games at all levels once or twice a week - I also had a QPR season-ticket as they returned to the Premier League after a 15-year absence. Consequently I did a lot of groundhopping and the reviews appeared here. Nowadays I leave that task mainly to you dear readers or other bloggers who are happy to have their work promoted here. Back then the guide used to feature a TLFG Top 10 which fairly strictly had one game and one game only from each of the 10 levels this blog covers. You could therefore see a game played on little more than a park pitch recommended over one in the Premier League but times have changed. Over the years I'm pleased to say women's football has grown significantly in popularity and made its way into TLFG, various other pages/indexes have been added and several clubs have come and gone at non-league level. It also says something that on week one of this blog, the top match in London was a game between a struggling Arsenal side and Sunderland who were both in the bottom six - the Gunners won 2-1. There have been lots of other moments but it has definitely had a big impact on my life. Not only do I know more about football in this city than I ever have but I have made some amazing contacts and experienced some great football moments both here and in Europe as a result. Apart from that, the other main highlights have all been in the form of feedback I've received from you. The whole purpose of this blog is to promote London football and make it as accessible to you as possible so when I hear or read that people have acted on advice I've given them and had a great time, then it makes all the effort that goes into this really worthwhile. On average this blog takes about eight hours a week to put together and often takes me well past my self-imposed midnight deadline on Sunday night/Monday morning as I try to cram in as much as possible while doing shift work - but if I didn't enjoy it then I wouldn't do it. It's also my birthday this week so hopefully I'll get to indulge in some live football at some point and tell you all about it on Sunday. Ok I think that's enough from me, enjoy your week and let me know what you've been up to - photos are always welcome on TLFG's Facebook page. 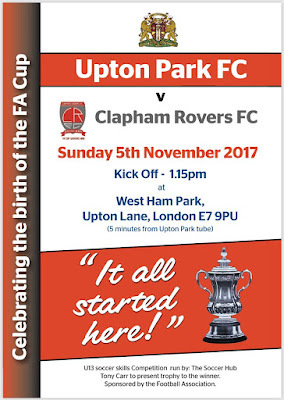 UPDATE: (02/11/17): If you're at a loose end on Sunday, it's just come to TLFG's attention that there's an historic match taking place in East London where the re-formed Upton Park FC will be playing Clapham Rovers in a re-enactment of the match which produced the first ever goal in the history of the FA Cup back in 1871. The match is being played in West Ham Park where the original tie was played. 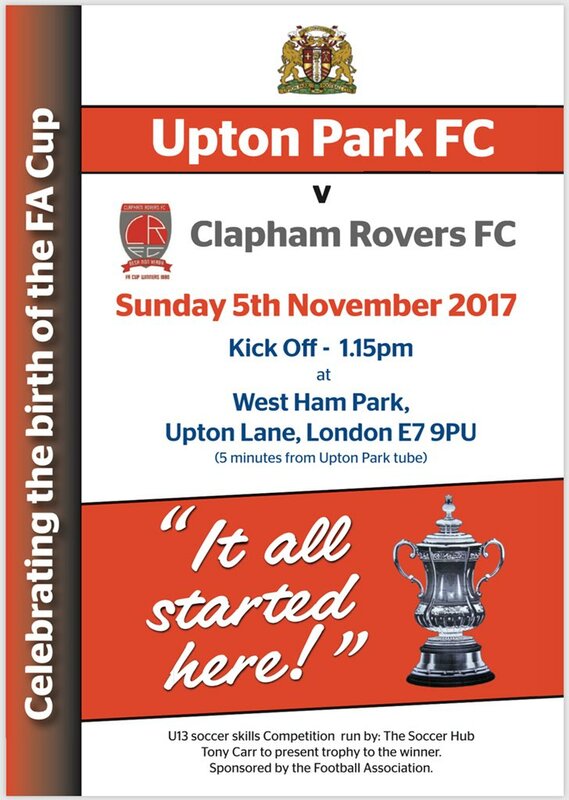 It will also be the first time Upton Park FC have played at their old home ground for over 100 years so it should be quite an occasion. It kicks off at 115pm and it's free to get in. There are over 90 matches in the London area over the next seven days as the Champions League, Premier League and Championship take centre stage. It's also a big week of cup football with the next round of the FA Cup taking place and a number of FA Trophy replays too. Brentford v Leeds United @530pm - at exactly the same time on the opposite side of London we have what could be a humdinger of a game in the second tier. The Bees are in lower midtable but are potentially a side on the rise after stringing together a seven-game unbeaten run. I say potentially because four of those games have been draws and it's holding them back. Leeds, on the other hand, made a great start and are up in fifth but on a worrying slide with four defeats from five. Brentford also have a great home record against the Yorkshire club with their last defeat coming nine games ago, way back in 1950! 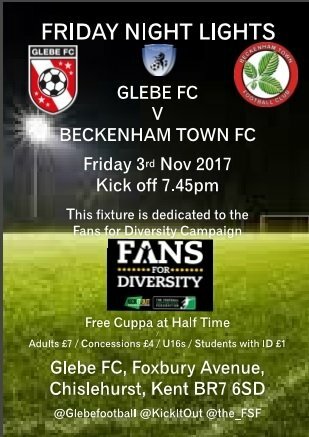 FA Cup First Round - with the qualifying rounds completed we've reached that magic moment when the surviving non-league clubs get the chance to play against professional sides from League One and League Two. In some cases, this can mean some of the minnows taking part in the biggest match in their history. Not only is this prestigious but it nets the smaller sides thousands of pounds in gate receipts and prize money which can prove to be transformational if invested wisely. The winners of each tie will receive a cheque for £18,000. Chelsea v Manchester United @430pm - the week comes to an end on my birthday and the football schedulers obviously noticed this as there's a great selection of games. The biggest game of the weekend takes place at Stamford Bridge where two of the heavyweights of the Premier League slug it out in the teatime game. The reigning champions are finding things relatively tough this season and struggled to get past struggling Bournemouth in Dorset on Saturday. Former Blues boss Jose Mourinho is likely to get a good reception on his return to Stamford Bridge but he'll be desperate to win this otherwise his current side could start to look like also-rans too. Our custom research paper writing business enterprise specializes in excessive college studies papers for cash, college studies papers for sale, custom university studies papers, as well as master’s customized research papers.